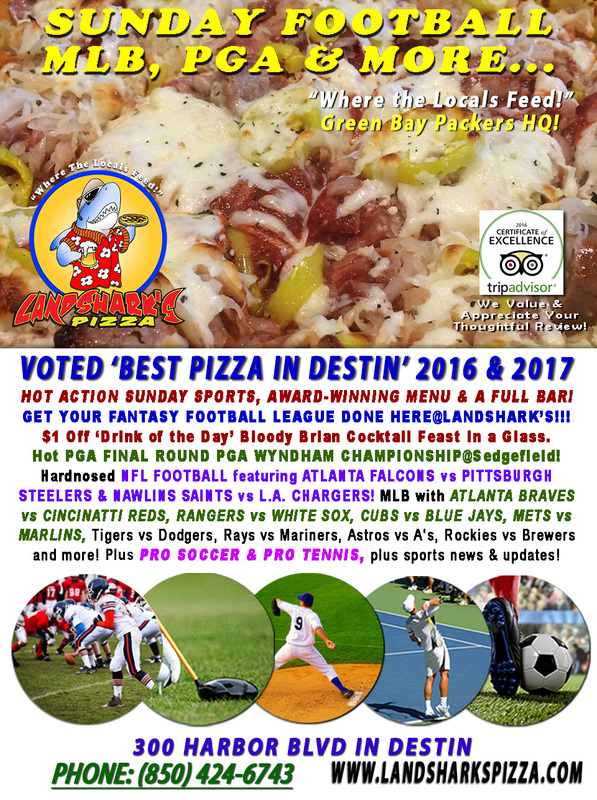 / Best Award Winning BBQ Destin FL / Super Saturday Exciting PACKERS, PATRIOTS, BRONCOS & More, NRA Night Race, PGA & MLB Action! Super Saturday Exciting PACKERS, PATRIOTS, BRONCOS & More, NRA Night Race, PGA & MLB Action! 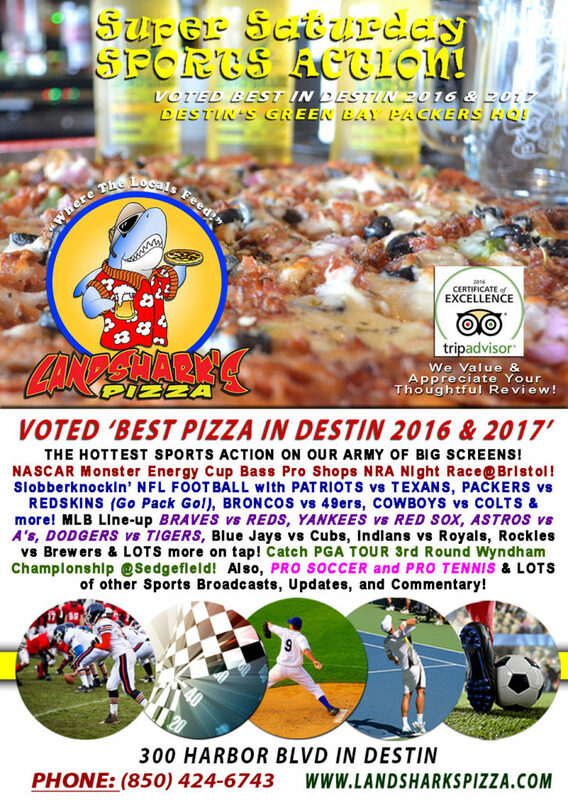 Join us here at Destin’s Packers Headquarters to enjoy a great summer Saturday with Racing, Football, Baseball, Golf & more while you chow down at Landshark’s in Destin where we combine the hottest sports action with a huge menu of Award-Winning Pizza, Award-Winning Wings, Award-Winning BBQ, a Oven-baked Subs, Calzones, a smorgasbord of appetizers and a FULL BAR! 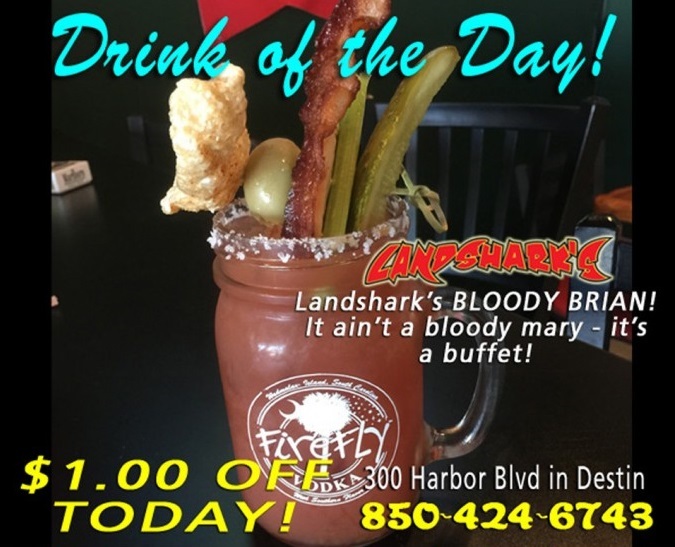 LANDSHARK’S DRINK OF THE DAY – $1.00 OFF our BLOODY BRIAN Super Cocktail – it’s like a feast in a glass – a buck off! 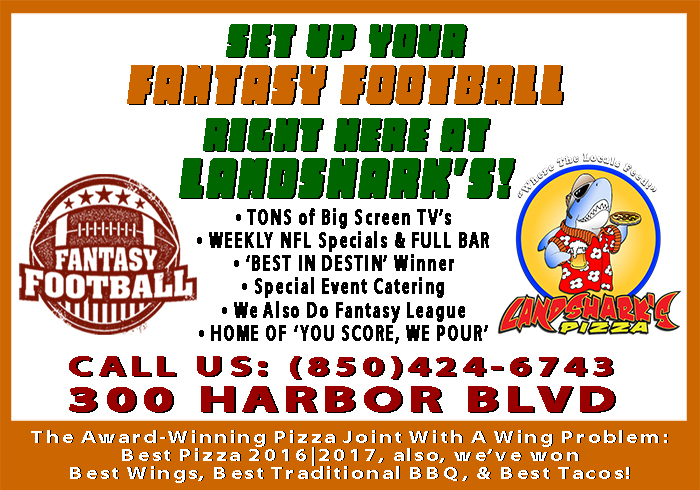 GET YOUR FANTASTY FOOTBALL DONE RIGHT HERE WITH US! SPORTS ON OUR ARMY OF BIG SCREENS – NASCAR Monster Energy Cup Bass Pro Shops NRA Night Race@Bristol. Slobberknocker NFL FOOTBALL featuring PATRIOTS vs TEXANS, PACKERS vs REDSKINS, BRONCOS vs 49ers, COWBOYS vs COLTS & more! Major League Baseball with BRAVES vs REDS, YANKEES vs RED SOX, ASTROS vs A’s, DODGERS vs TIGERS, Blue Jays vs Cubs, Indians vs Royals, Rockies vs Brewers, Rangers vs White Sox & LOTS more on tap! 3rd Round PGA GOLF WYNDHAM CHAMPIONSHIP@Sedgefield! Also, PRO SOCCER and PRO TENNIS coverage plus plenty of other Sports Broadcasts, Sporting News, Analysis, and Commentary! 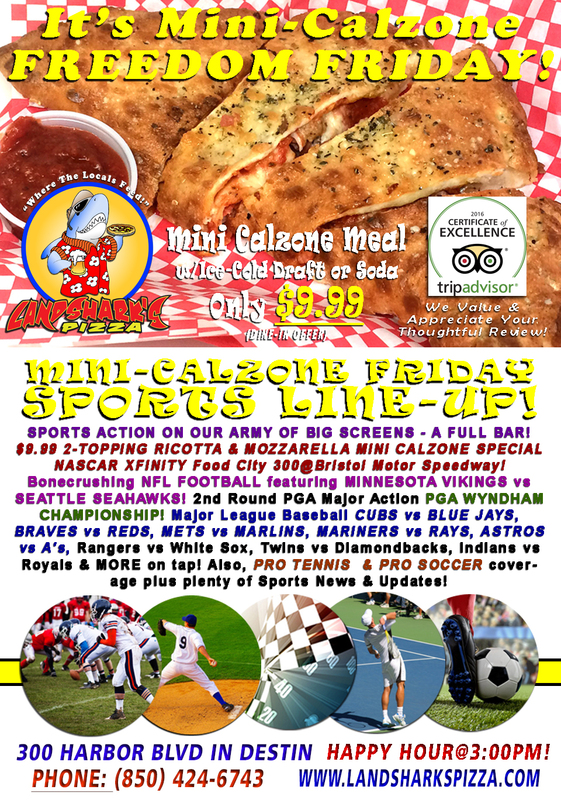 Previous Post: « All-American Freedom Friday NASCAR,NFL, PGA & MLB & $9.99 2-Topping Calzone w/Beer!